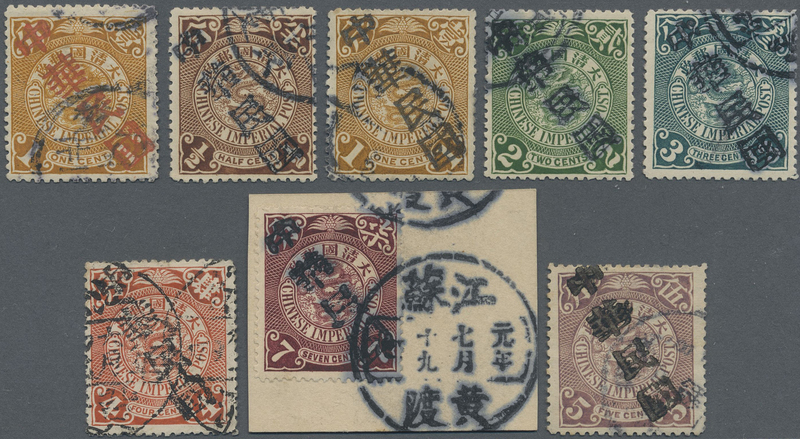 5942 ungebraucht (hinged) * ungebraucht ohne Gummi (unused without gum) (*) gestempelt (marked) 1911, Local "China Republic" Overprints, Hopeh province Tientsin, ovpt. 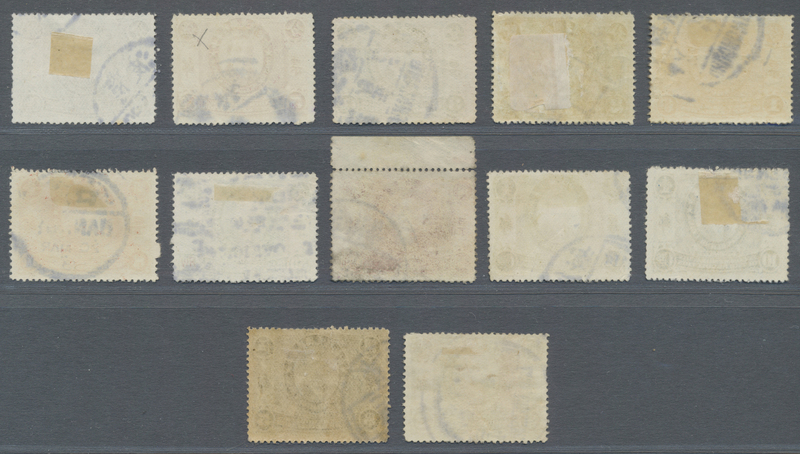 in blue, 7 C. used on piece; in black on 1/2 C. unused mounted mint, 1 C. no gum and 2 C., 3 C., 5 C., 20 C., 30 C. and 50 C. used. 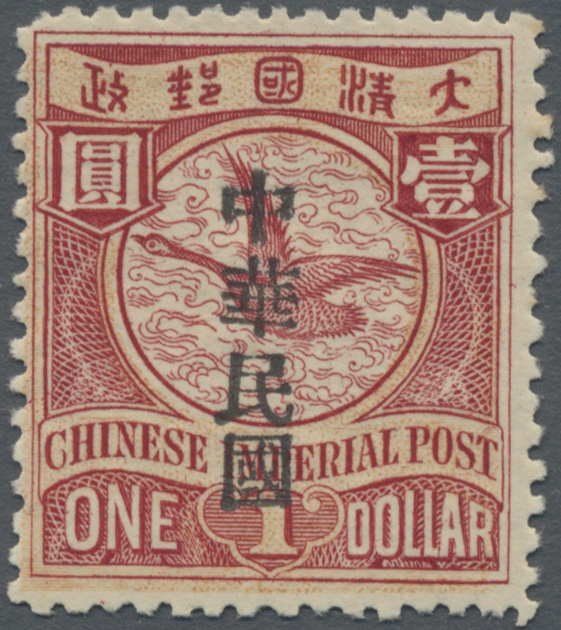 Also a Peking ovpt. 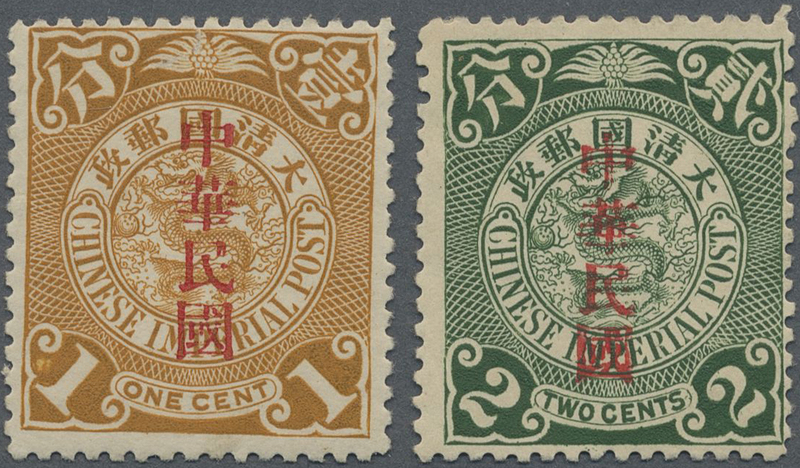 on 2 C. used (in Chan "other p.o., Lane location 36), Waikwan in red on 1/2 C. used, also red on 1 C. of Kihsien (Ji Xian, unlisted), as is. Chan RLHP, 1A2; RLHP, 1 B 1-3 etc., ca. $1000.-. 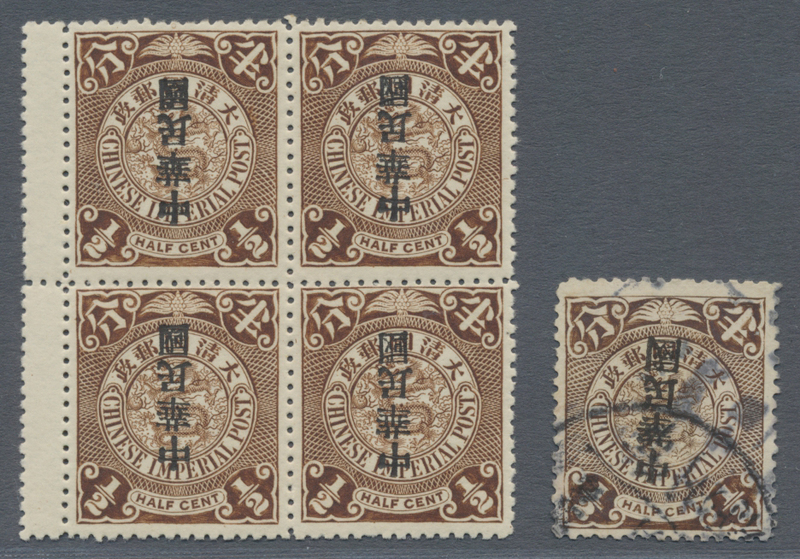 5943 ungebraucht (hinged) * ungebraucht ohne Gummi (unused without gum) (*) gestempelt (marked) 1911, Local "China Republic" Overprints, Kiangsi province Kiukiang, ovpt. 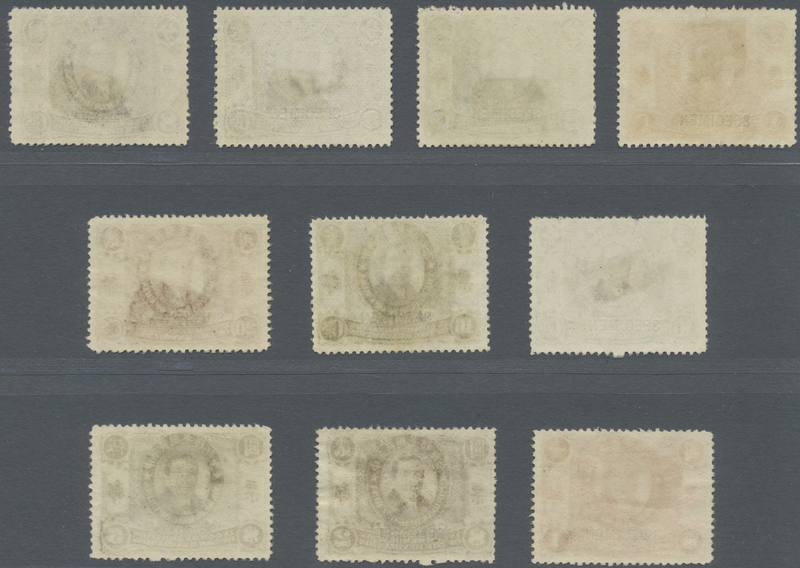 in black on 1/2 C. no gum, 1 C. mounted mint, 2 C. and 3 C. used; in red on 2 C. and 20 C., both used (Chan RLK!, 1B1, 3 etc. ca. $680). 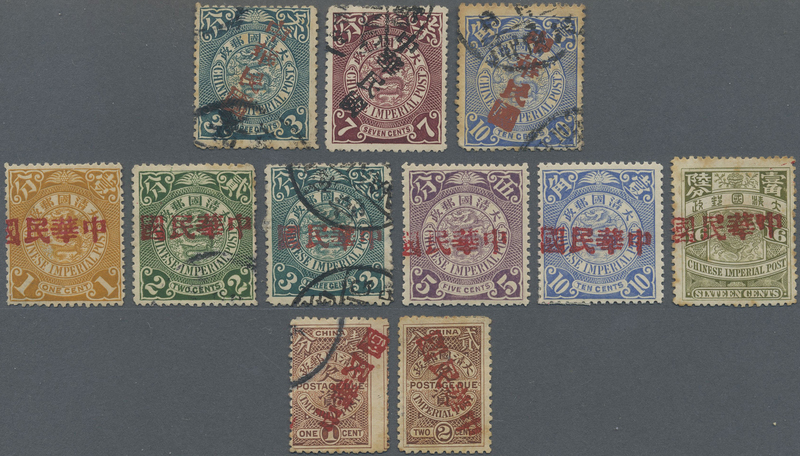 5944 ungebraucht (hinged) * ungebraucht ohne Gummi (unused without gum) (*) gestempelt (marked) Briefstück (on piece) 1911, Local "China Republic" Overprints, Kiangsi province Tuchang Hsien, ovpt. 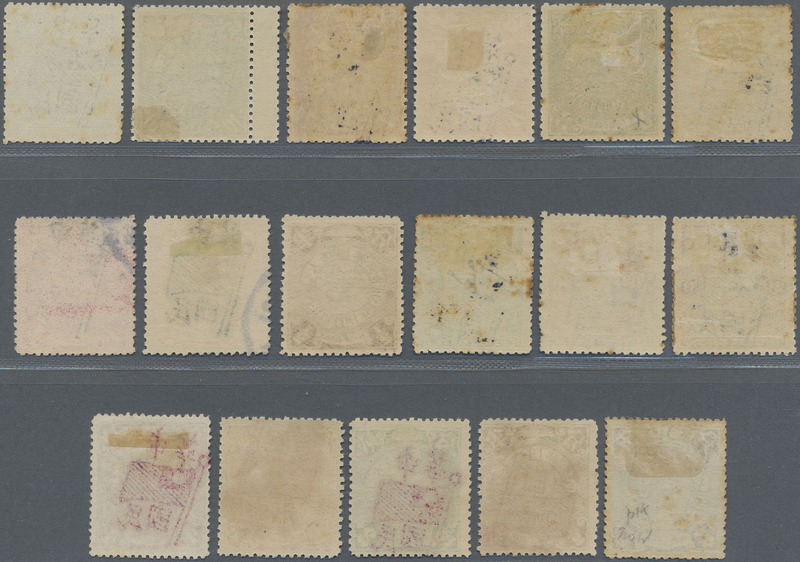 in black on 3 C. and 4 C., unused partial gum; 4 C. and 3 C., each ovpt. 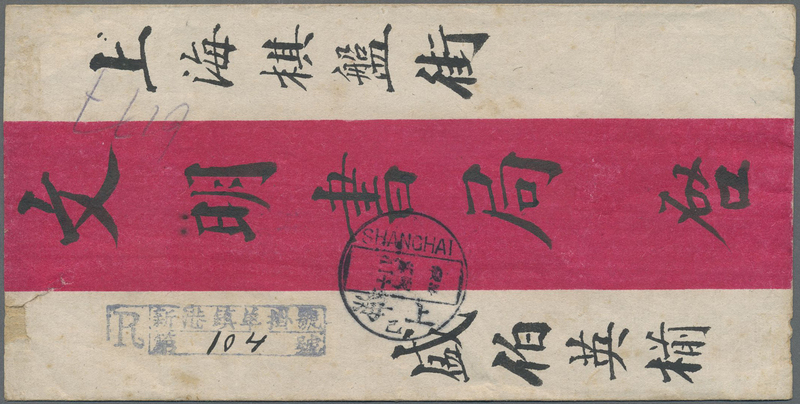 inverted, tied bilingual "TUOCHANGHSIEN 1.7.17" to piece, ex-Sir David Percival colletion; in red on 1 C., ovpt. sideway, from left to right, used, the piece pictured in Chan Vol. 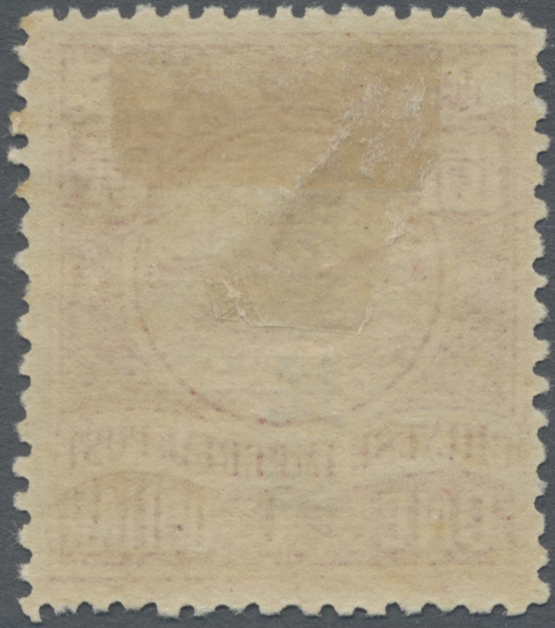 2 p. 580 (Chan RLKI 2A, 3, 4, 4a, RLKI 2B 2a, $760). 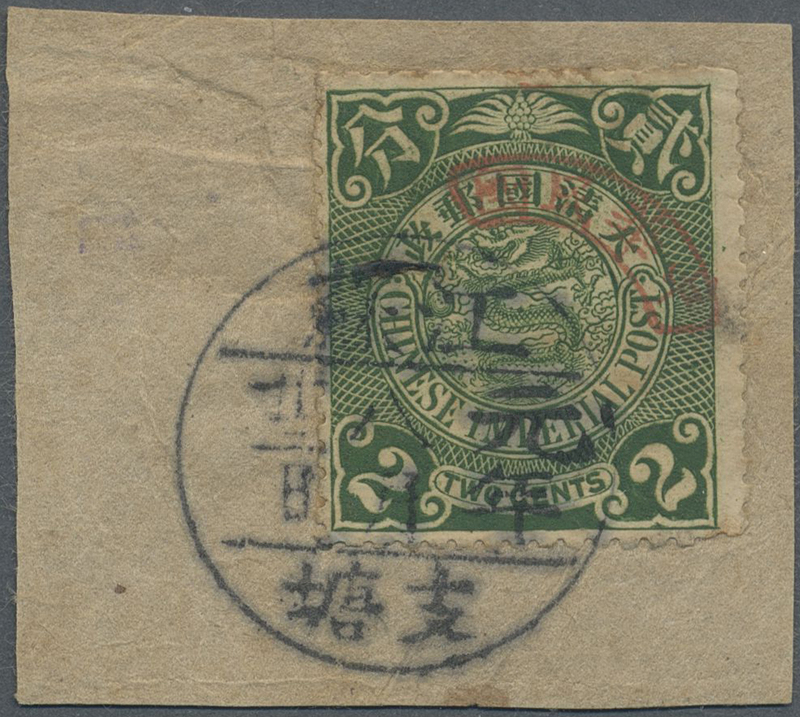 5945 Brief (cover) 1911, Local "China Republic" Overprints, Kiangsu province Hwangtu, ovpt. in red upper-left-to-lower right: 1/2 C.-7 C. ea. 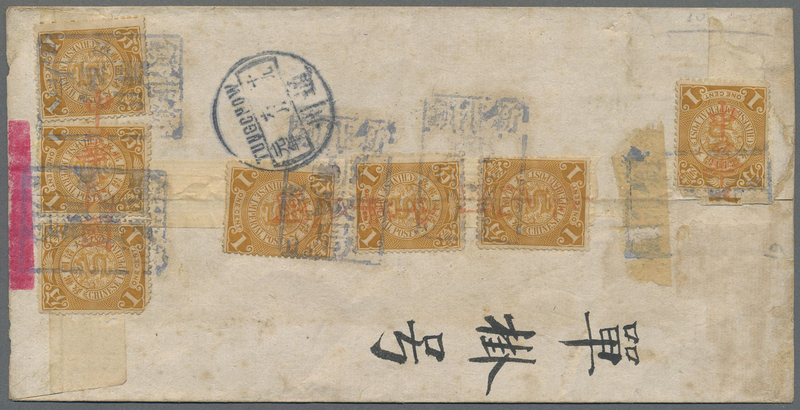 tied boxed dater "Kiangsu.Hwangtu 1.7.17" (July 17, 1912) to cover to Shanghai with Jul 19 arrival (Chan RLKS, 1B. 1-7). - Pictured in Chang Vol. 2 p. 595. 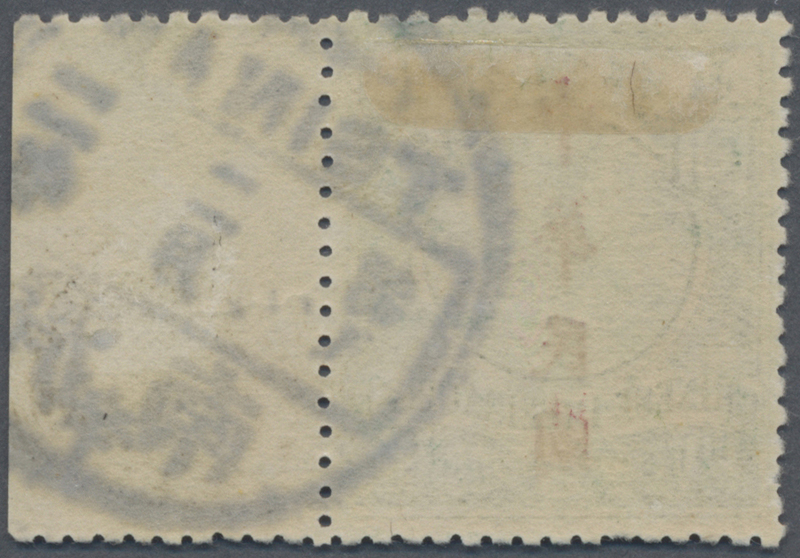 5946 ungebraucht (hinged) * ungebraucht ohne Gummi (unused without gum) (*) gestempelt (marked) 1911, Local "China Republic" Overprints, Kiangsu province Nanking, ovpt. 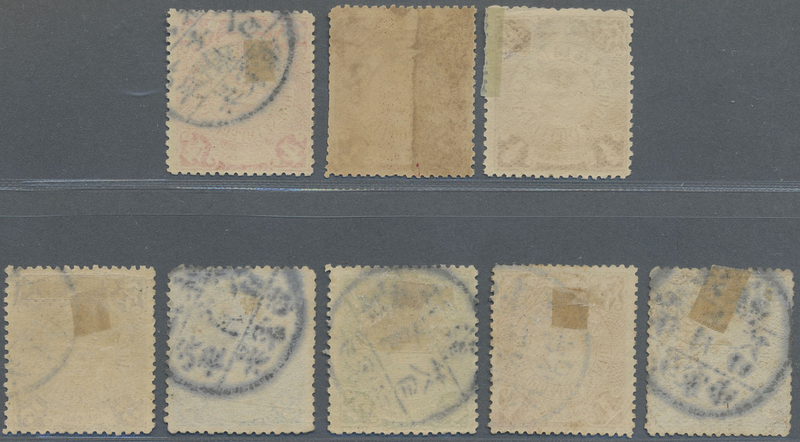 in black top right to bottom left, 7 C. used (Chan RLKS2A, 7); same in red on 2 C., 10 C. the latter thins, used (RKLS 2B type, these values not in Chang); in red llarge horizontal 1 C., 5 C., 10 C. and 16 C. unused ´no fum, resp. 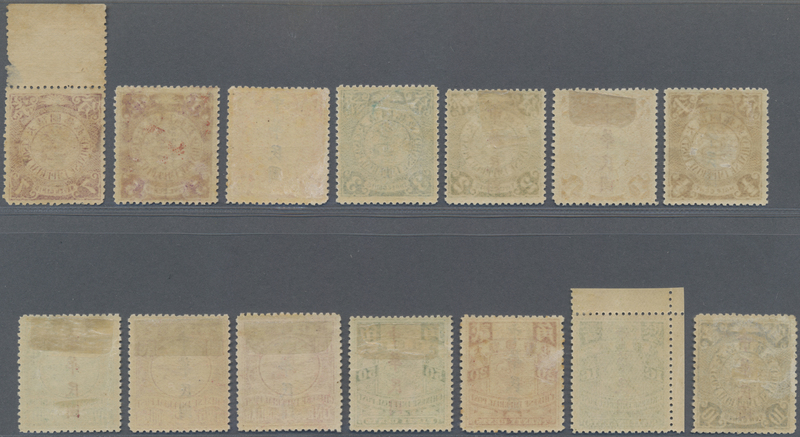 used 2 C., 3 C. (Chan RLKS 2 C.1-4, the 10 and 16 C. unlisted); same on dues (unlisted in Chan) 1 C. inverted and used resp. 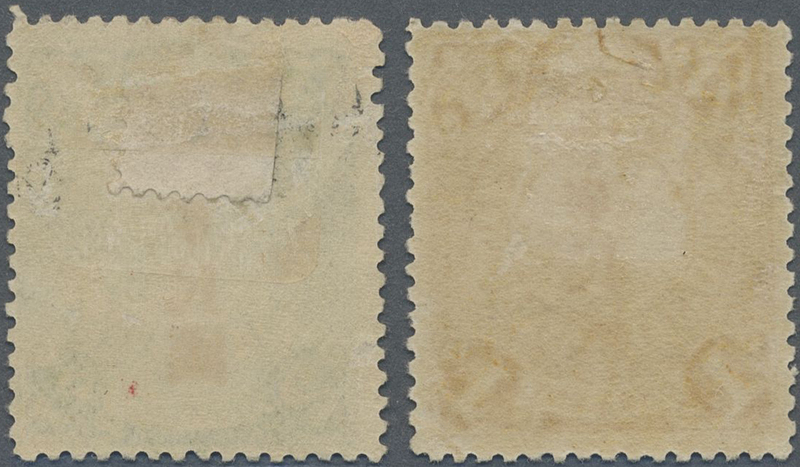 2 C.unused mounted mint, as is (ca. $1760). 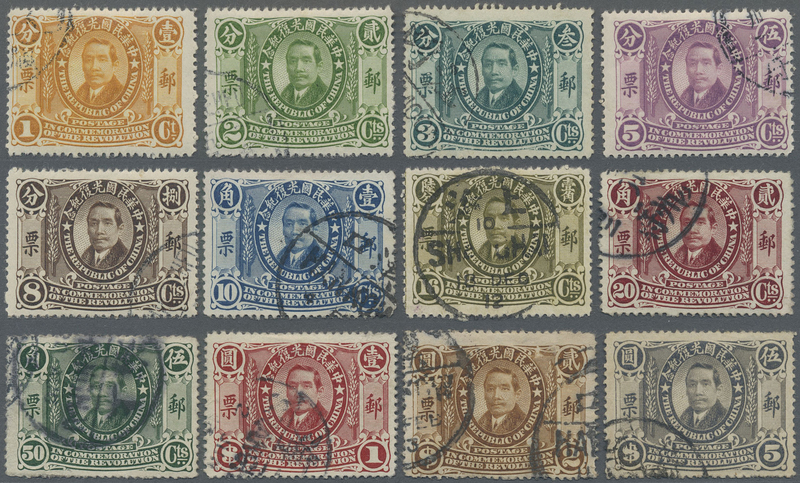 5947 gestempelt (marked) 1911, Local "China Republic" Overprints, Kiangsu province Soochow, ovpt. in red on 2 C., 3 C. and 5 C., used (Chan KLKS, 3B 1-3), the 5 C. beeing pictured in Chan p. 582; and ln black on 1/2 C., ovpt. inverted, used (Chan RLKS, 3 C 1a). Total Chan $456. 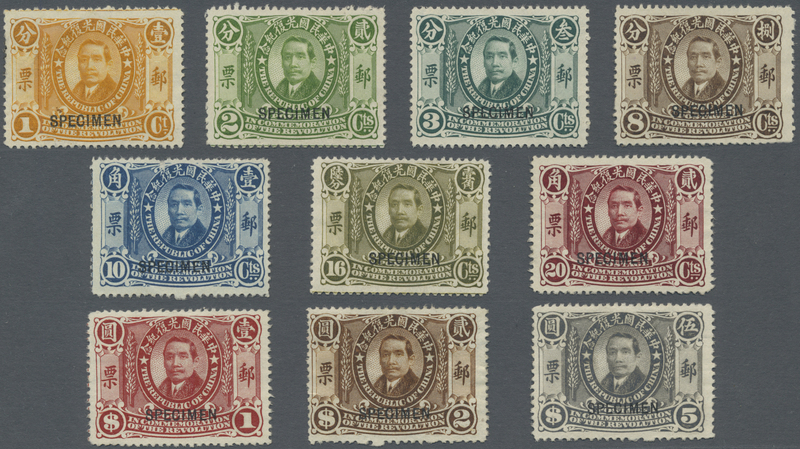 5948 ungebraucht ohne Gummi (unused without gum) (*) gestempelt (marked) Briefstück (on piece) 1911, Local "China Republic" Overprints, Kiangsu province Wukiashih, half moon framed ovpt: in black on 1/2 C. and 1 C. unused no gum resp. 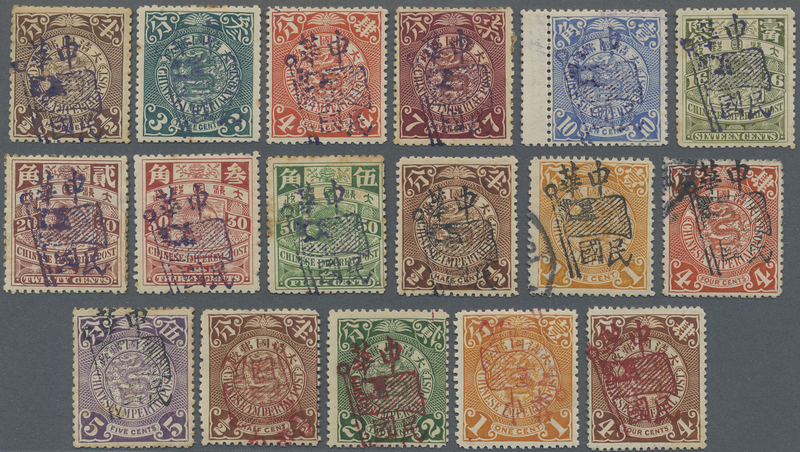 4 C. used; same in red in 1/2 C., 1 C., 2 C., 3 C. and 5 C. used (Chan unpriced used) plus another 2 C. tied lunar dater "Kiangsu Chitang" to piece, signed Chang (Chan RLKS.5A 1-3, 5B 1-5; min. $432). 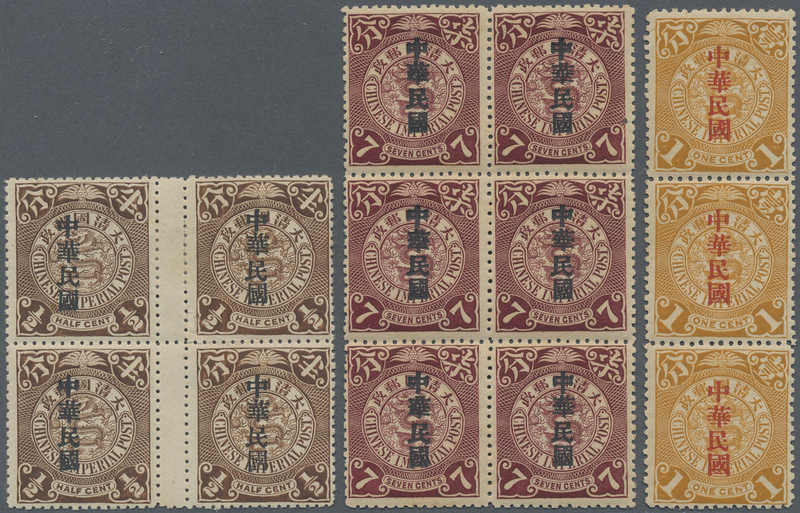 5949 ungebraucht (hinged) * ungebraucht ohne Gummi (unused without gum) (*) gestempelt (marked) 1911, Local "China Republic" Overprints, Kiangsu province Sankongshan, large red ovpt. 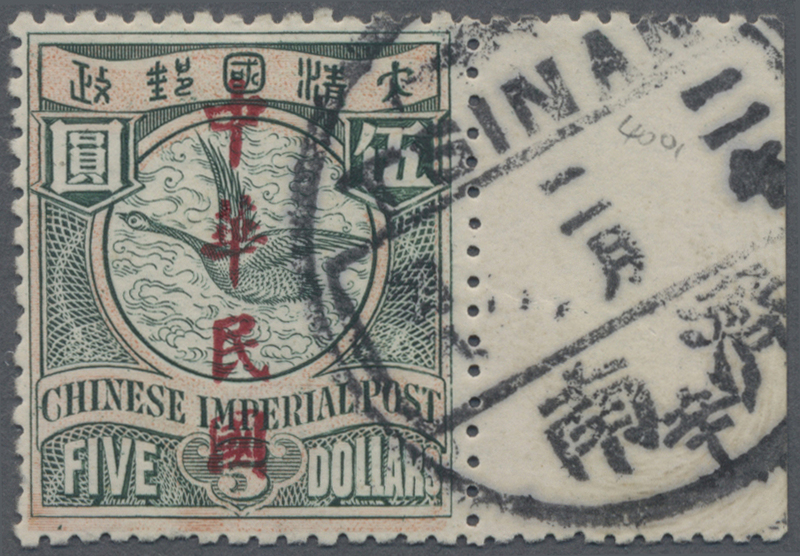 37 1/2 mm going over vertical three stamps, coiling dragon 1 C. (7, one fallen off) tied tombstone "Sankongshan/post office" to reverse of registered red band cover via boxed bilingual "TUNGCHOW 1.6.19 (June 6, 1912) to Shanghai . 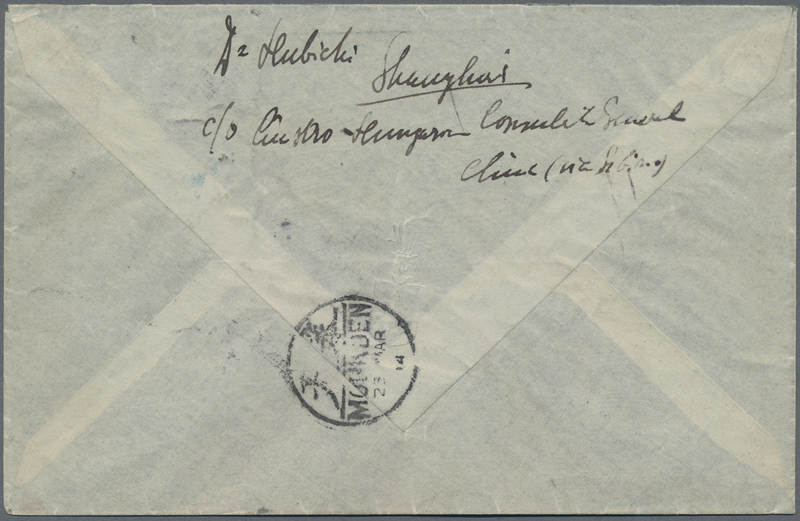 Amazing commercial cover combining local overprints and tombstone postmark usage. 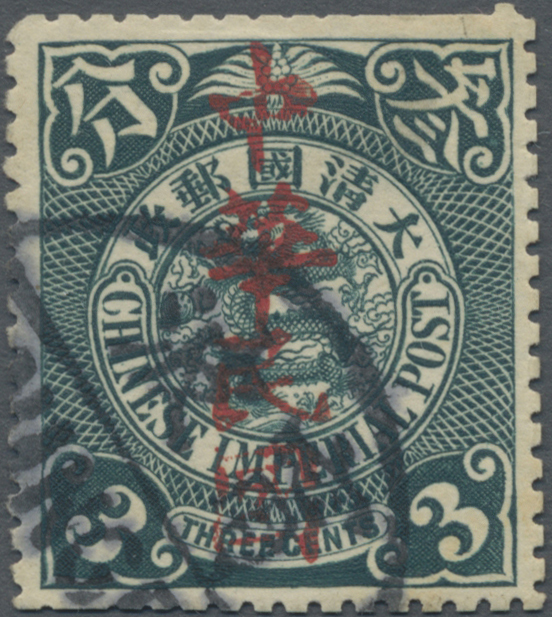 5950 gestempelt (marked) 1911, Local "China Republic" Overprints, Kiangsu province Tungtaihsien, ovpt. 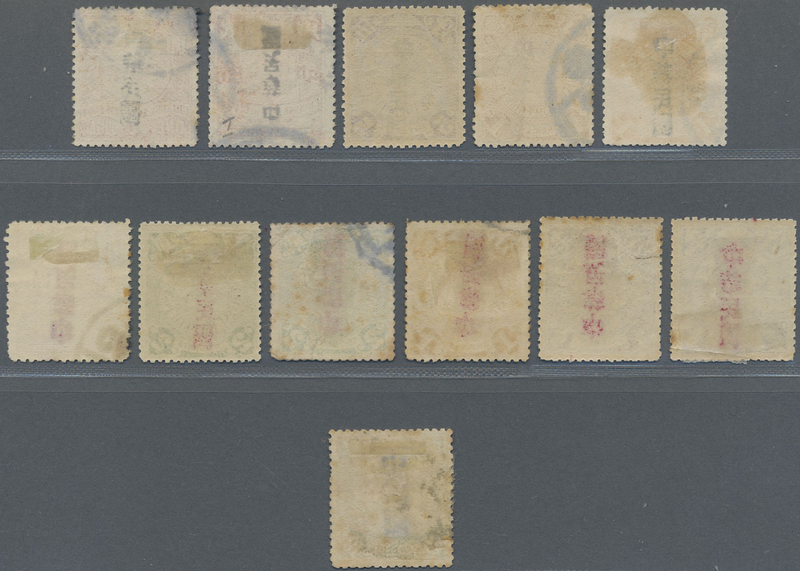 in red vertical on 1 C., 2 C., 5 C., used, unlisted in Chan or Lane, ex-Mizuhara collection. 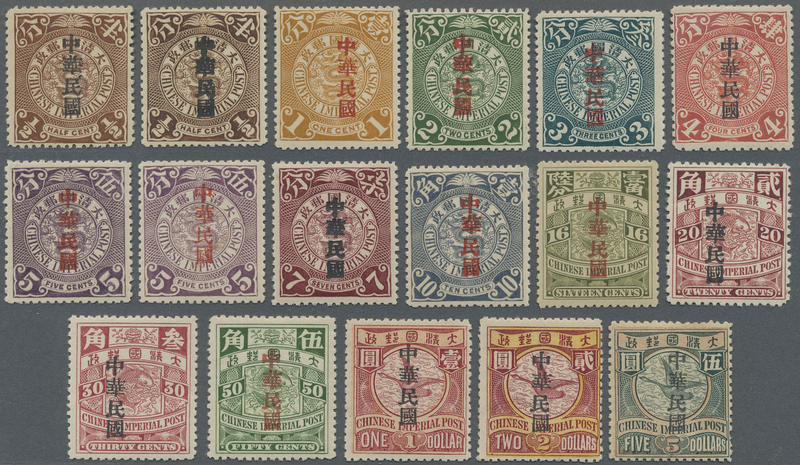 5951 gestempelt (marked) 1911, Local "China Republic" Overprints, Kiangsu province Wusih, vertical in red on 1 C., ovpt. inverted canc. 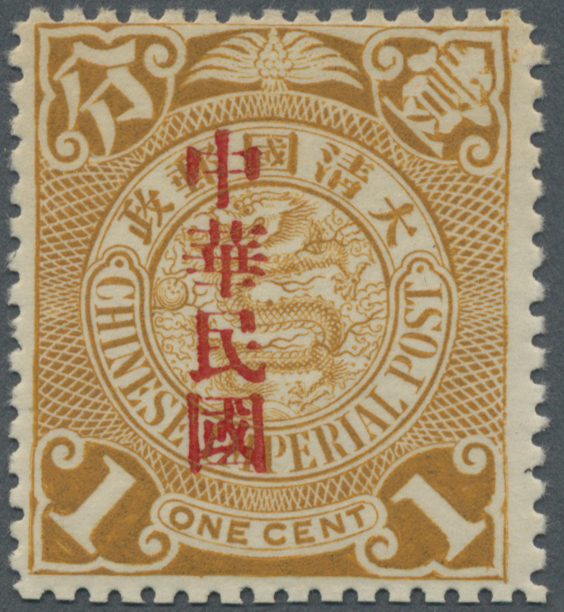 boxed bilingual "WUSIH 1.10.3" (Oct. 1, 1912), bottom scissor separation, Chan RLKS, 6A, 1 var - invert beeing unlisted in Chan. And ovpts. 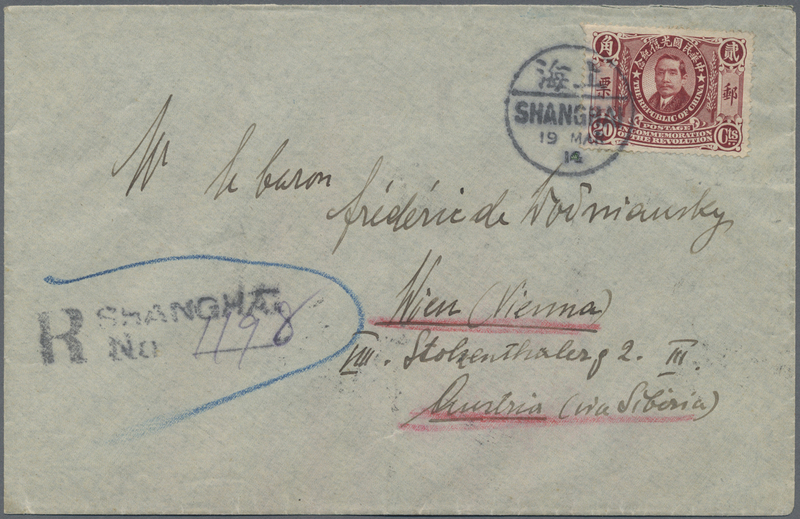 (3) attributed to Shanghai according postmark, Chang or Lane unlisted: red vertical invert on 2 C., black on 1 C. resp. black diagonal right to bottom left. 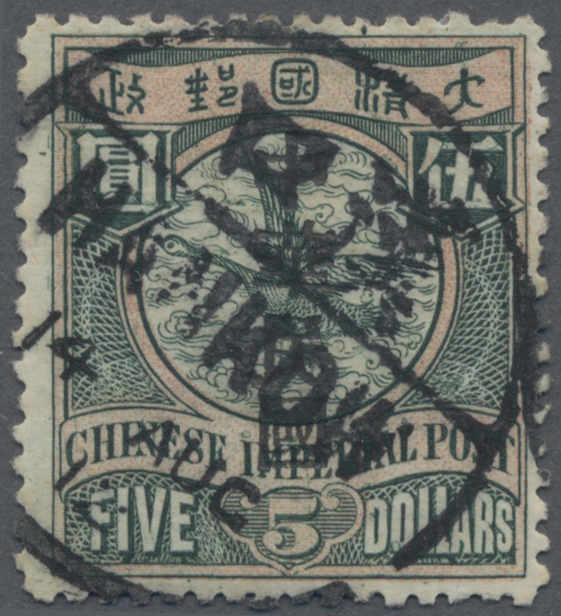 5952 gestempelt (marked) Briefstück (on piece) 1911, Local "China Republic" Overprints, Kiangsu province Hwangtu, ovpt. in red on 1 C. used; ovpt. in black on 1/2 C.-5 C. ea. 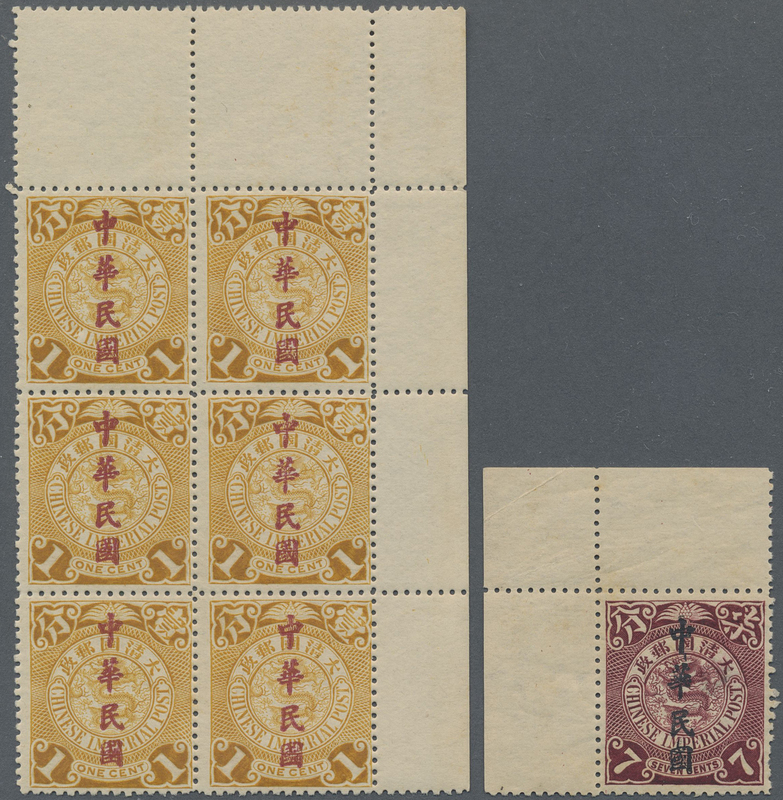 used, on 7 C. tied to piece "Kiangsu.Hwangtu 1.7.19" (Chan RLKS.1A; RLKS.1B, 1-7, $218). 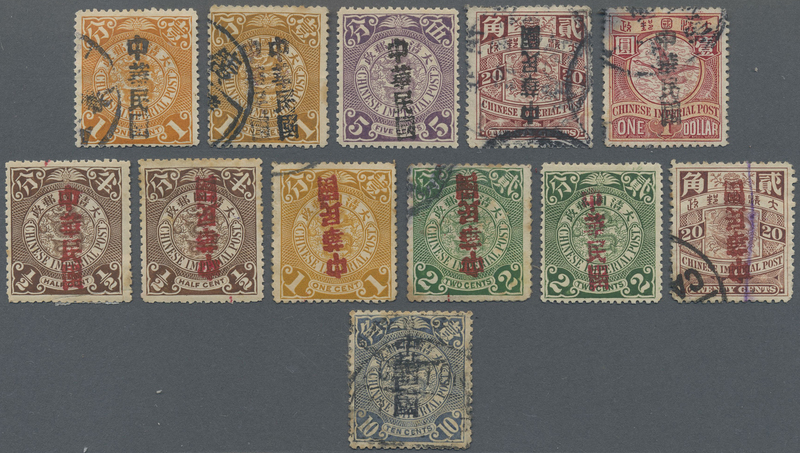 5953 ungebraucht ohne Gummi (unused without gum) (*) ungebraucht (hinged) * gestempelt (marked) 1911, Local "China Republic" Overprints, Kirin province Harbin, ovpt. 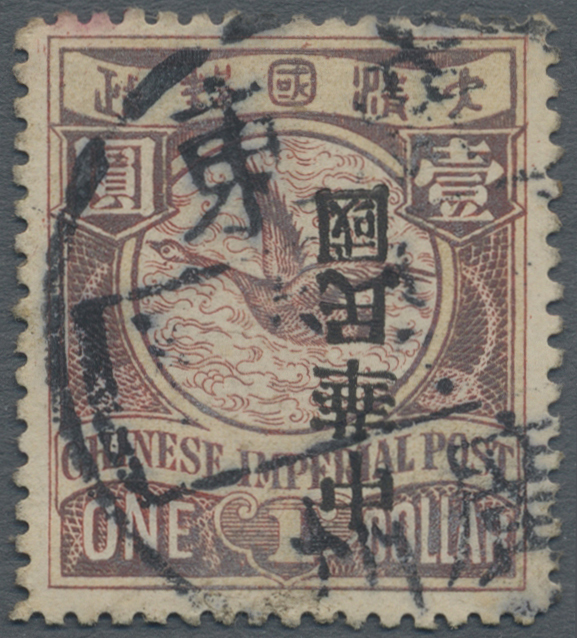 "China" in black 1/2 C., 2 C. (double ovpt. 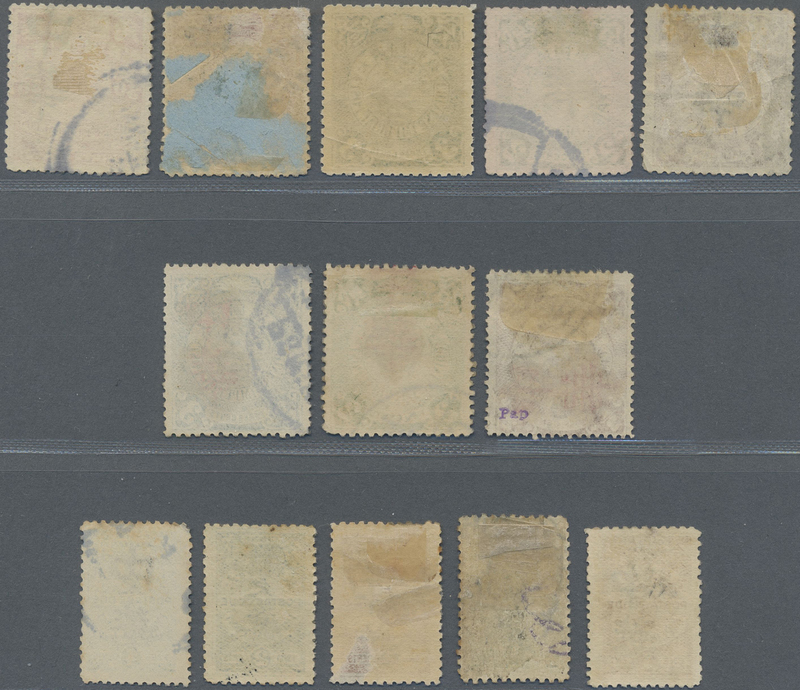 ), 5 C. 20 C. used and 3 C. mounted mint LH (slight crease), in red 1/2 C. (ovpt. 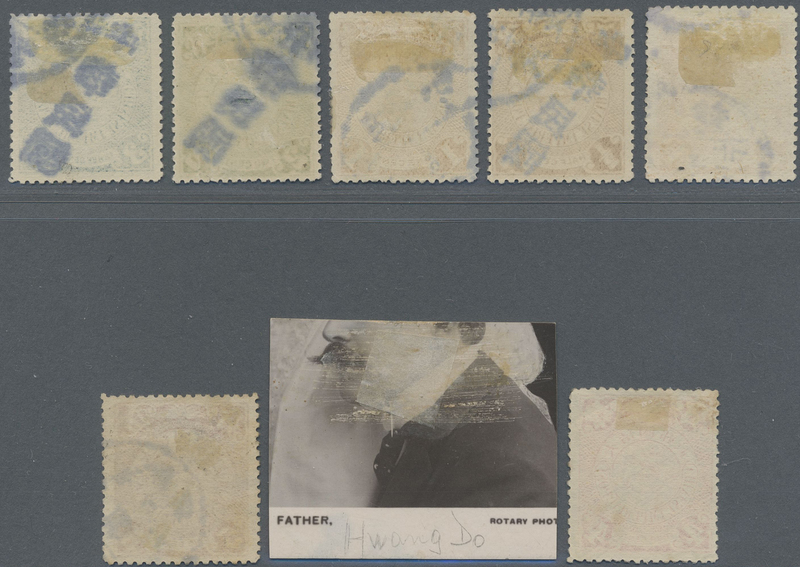 sideways), 2 C., 3 C. used; in black on dues 1 C. brown (rubbing) and 2 C. blue mint partial gum resp. 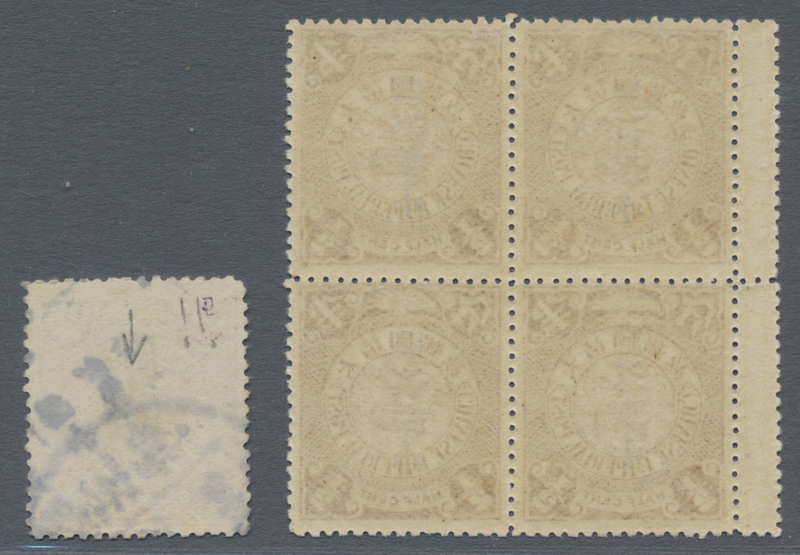 1 C. blue, 2 C. brown and 4 C. used (Chan RLKR, 1 B1/10-ex, RLKR, 1 C. 1/4, RLKR. 1E.1, 2 and unlised, Chan ca. $788.- + unlisteds). 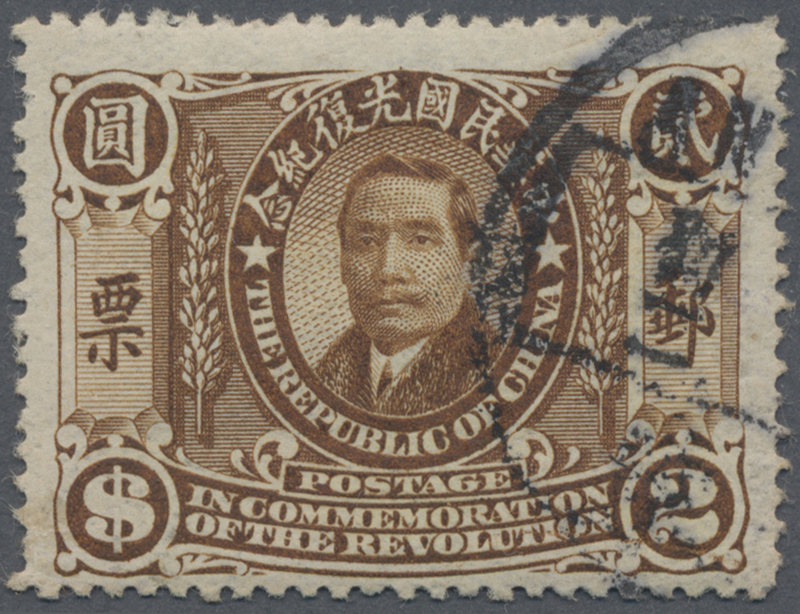 5954 postfrisch (never hinged) ** ungebraucht (hinged) * ungebraucht ohne Gummi (unused without gum) (*) 1911, Local "China Republic" Overprints, Kwangsi province Liuchow, 1 C.-10 C. cpl. 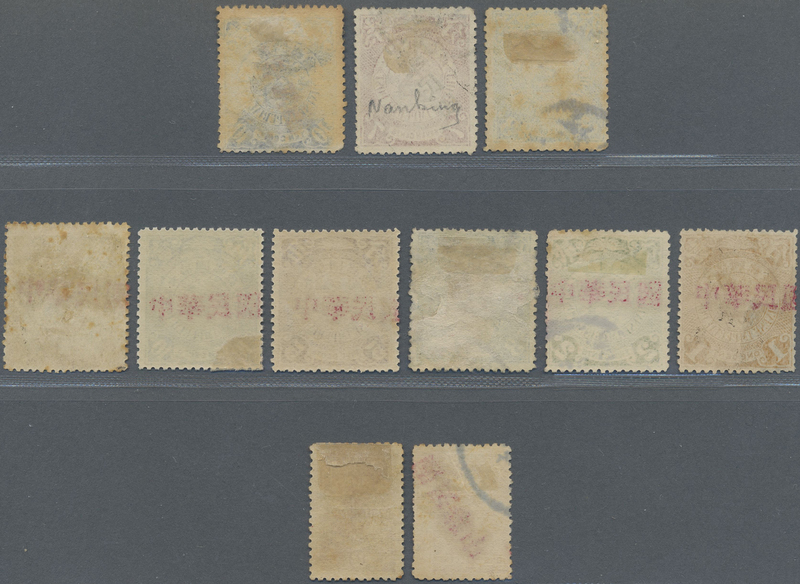 set, the 2 C. no gum, otherwise mounted mint first mount LH or mint never hinged MNH (Chang RLKW, 1A. 1-5; $1100). 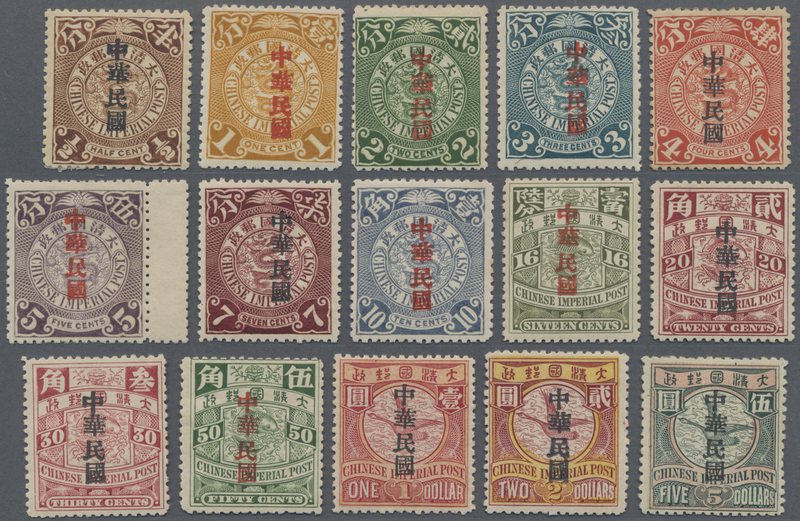 5955 ungebraucht (hinged) * ungebraucht ohne Gummi (unused without gum) (*) gestempelt (marked) 1911, Local "China Republic" Overprints, Kwangtung province Canton, ovpt. vertical in black 20 C. inverted resp. $1 each used, also unlisted 1 C. (2, one double ovpt. ), 5 C.; same in red 1 C. ovpt. 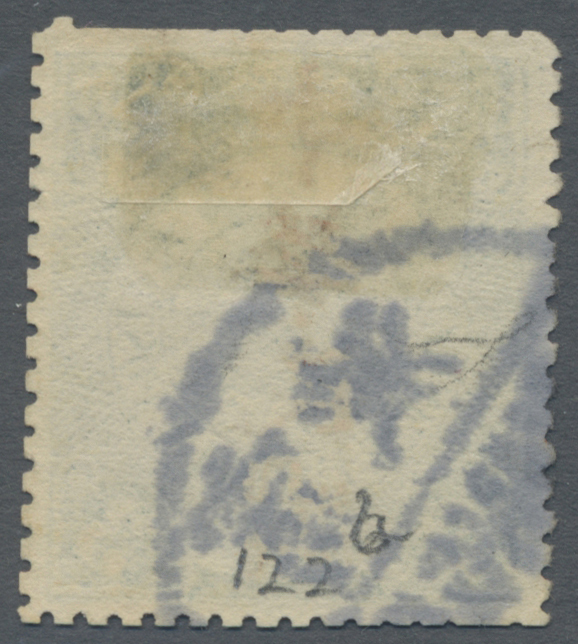 inverted, 2 C. (2, one ovpt. 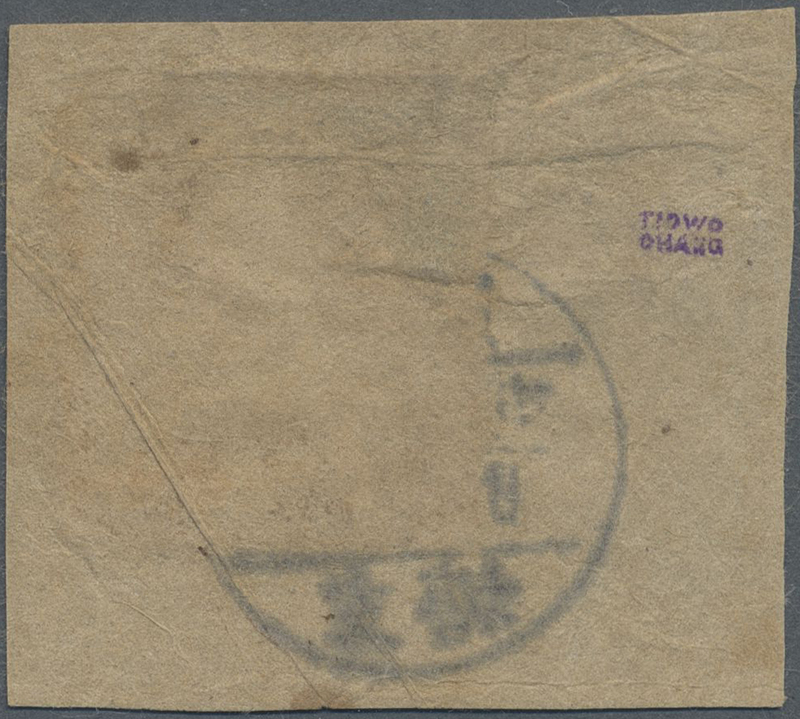 inverted), 20 C. ovpt. inverted, i. 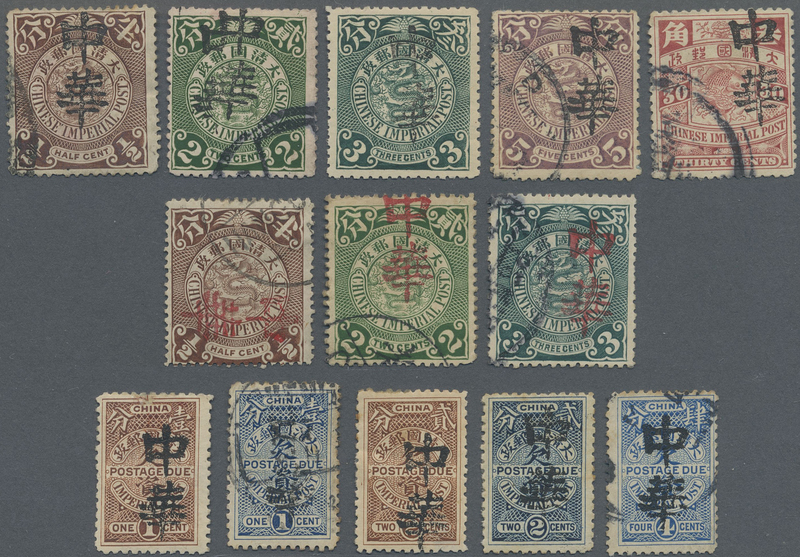 And 10 C. w. Canton Chan type C, unlisted on this value in Chan, used (Chan RLKT, 1A1a, 3; RLKT. 1 1a, 2, 4 and unlisteds, ca. $2100). 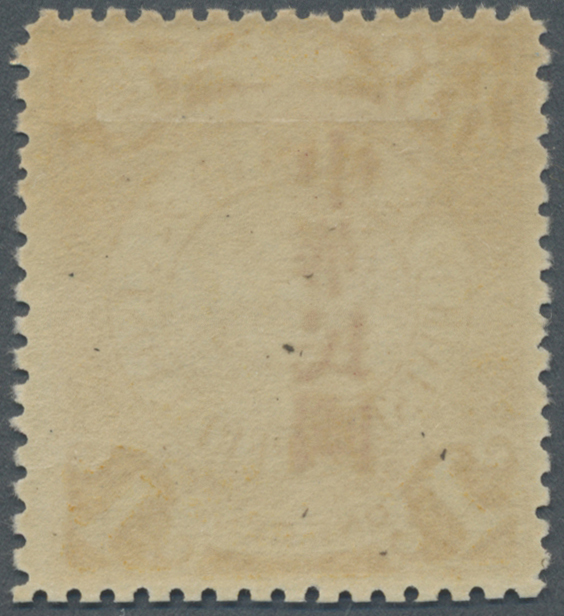 5956 ungebraucht (hinged) * ungebraucht ohne Gummi (unused without gum) (*) gestempelt (marked) 1911, Local "China Republic" Overprints, Kwangtung province: Foshan, in black on 4 C. red, used (Chan RLKT.2); Kongmoon; in red on 3 C, 5 C., 7 C., unused mounted mint, but 3 C. no gum (Chan RLKT.3, 2, 4, 5); Taiwan, 1 C. with red ovpt., ovpt. inverted, used (Chan RLKT.5, 1a). Chan $810. 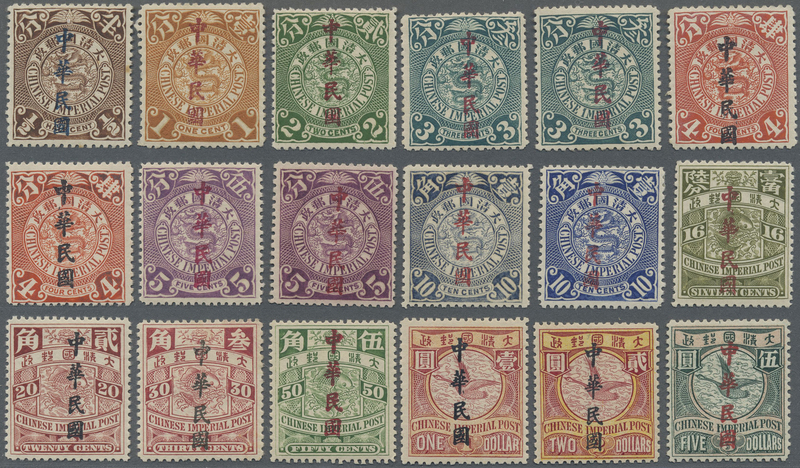 5957 ungebraucht (hinged) * ungebraucht ohne Gummi (unused without gum) (*) gestempelt (marked) 1911, Local "China Republic" Overprints, Kwangtung province, Tsinshan, large with flag, in violet: 3 C., 4 C., 7 C., 16 C. and Chan unlisted: 1/2 C., 10 C., 20 C., 30 C., 50 C., unused mounted mint, 3 C. tiny thin and 30 C., 50 C. few tone spots. 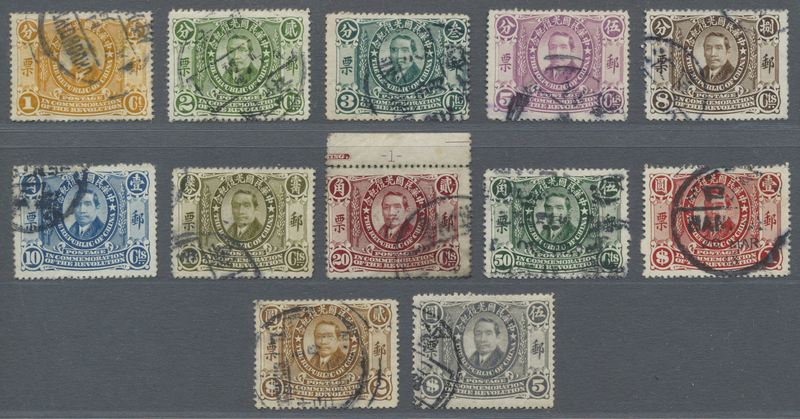 Not in Chan are, large with flag in black on 1/2 C no gum., 1 C. used and 4 C. each 5 C. unused mounted mint; and in red on 1/2 C. (inverted), 1 C. (inverted), 2 C., 4 C. brown unused no gum (but 1 C. mounted mint). Chan RKLT. 6, 2-5 and unlisteds, ca. $2650, total 17 copies, as is. 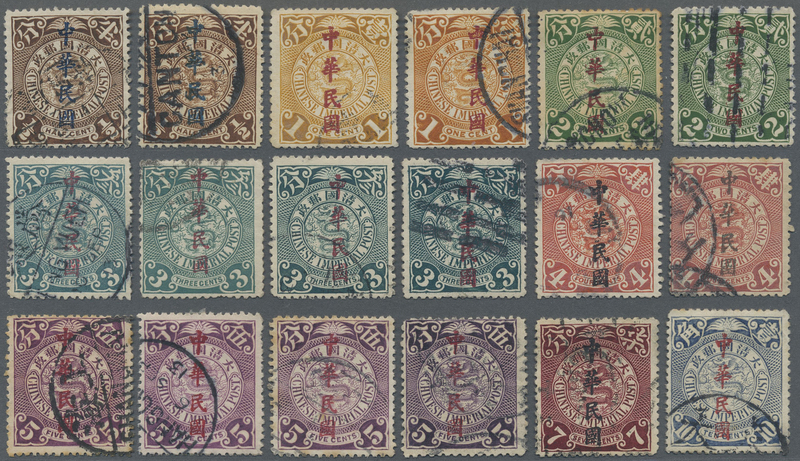 5958 gestempelt (marked) 1911, Local "China Republic" Overprints, Yunnan province, Tengyueh, red on 3 C. canc. 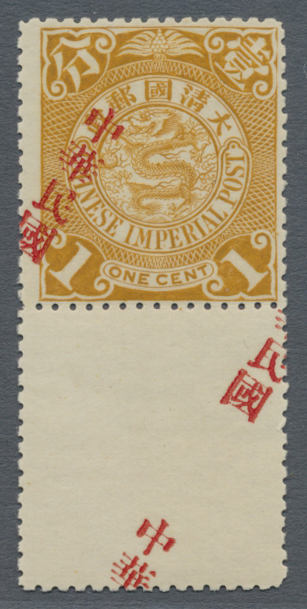 "NINGPO", see Chan explanation, slight scissor separation in parts, ex-Sir David Roseway collection (Chan RLYN 1.1; $290). 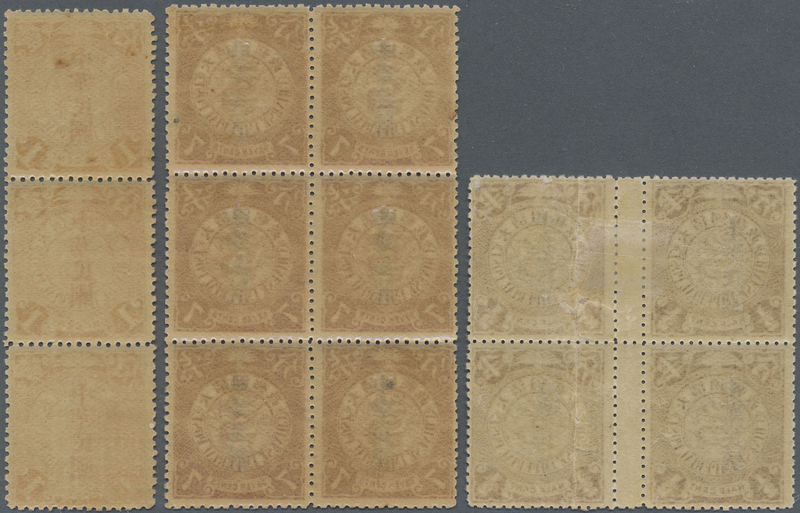 5959 ungebraucht (hinged) * ungebraucht ohne Gummi (unused without gum) (*) gestempelt (marked) 94 K (5) 1912, Statistical Office overprint, 1/2 C. ovpt. 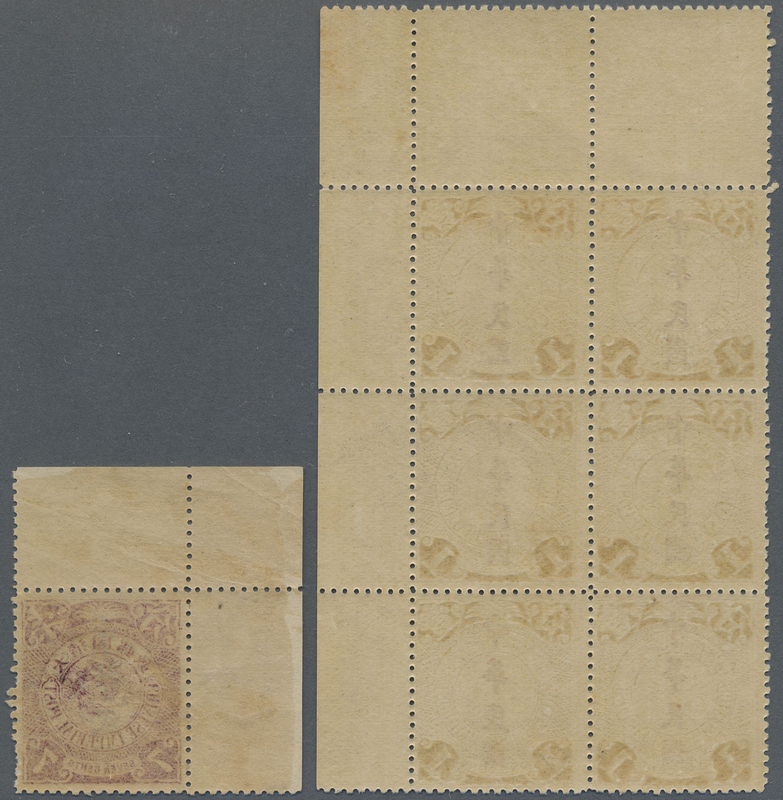 inverted: brown, left-selvadge block of four, unused mint partial gum (Chan 152b). 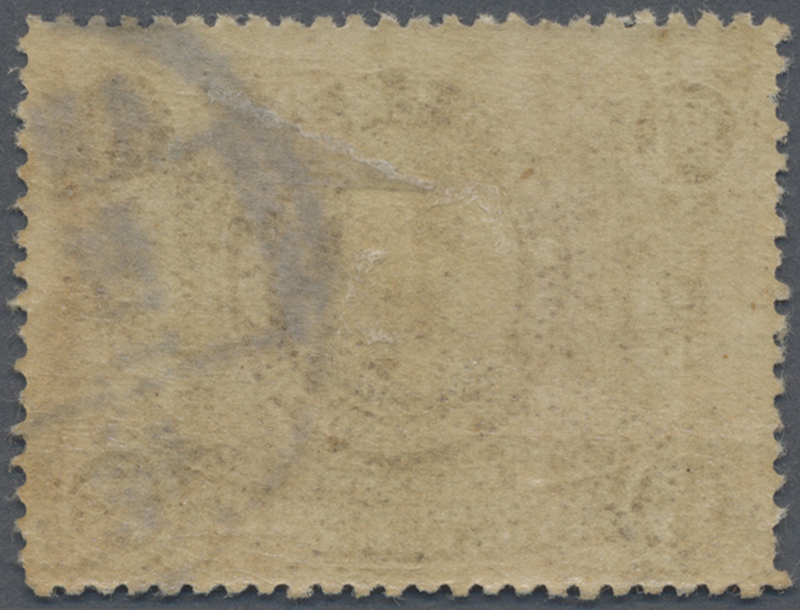 And a used copy in chocolate, slightly shifted ovpt (Chan 152f). Chan $550. 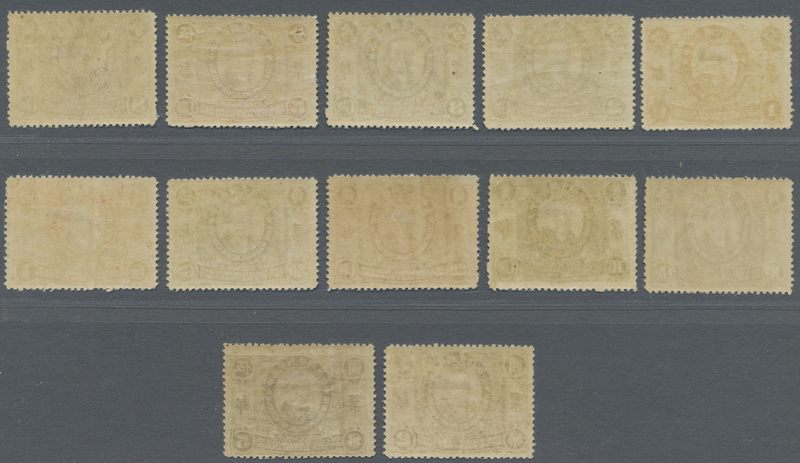 5960 ungebraucht (hinged) * postfrisch (never hinged) ** 94/108 inc. 95II/96I 1912, Statistical Office overprint, 1912, set 1/2 C.-$5 complete, extra copies 1/2 C. with heavy ovpt. resp. 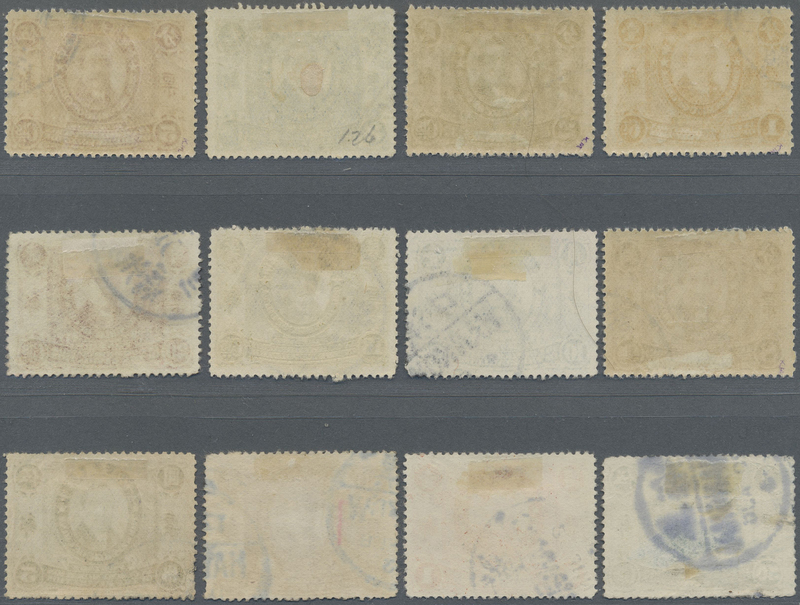 interpanneau-block-4, 5 C. with weak surcharge, 7 C. MNH block-6 (2x3), unused mounted mint and the singles very light hinge LH Also Commercial Press ovpt. 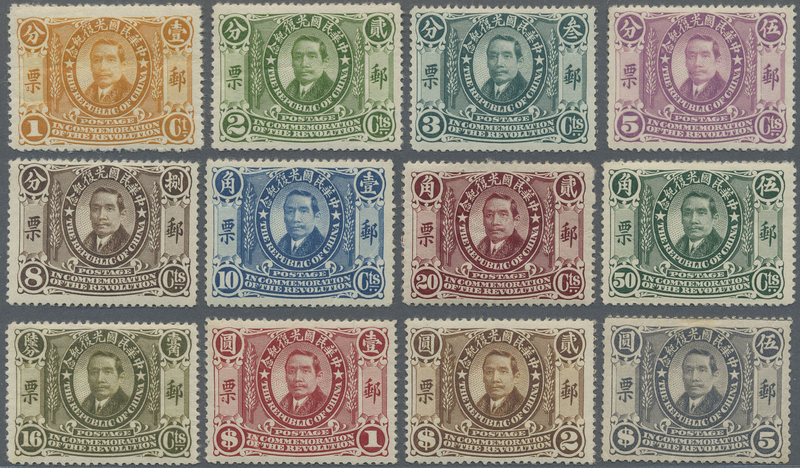 with large "kuo" 1 C., 2 C. unused mounted mint plus extra 1 C. vertical strip-3 MNH, a quality assembly (Michel cat. ca. 1840.-). 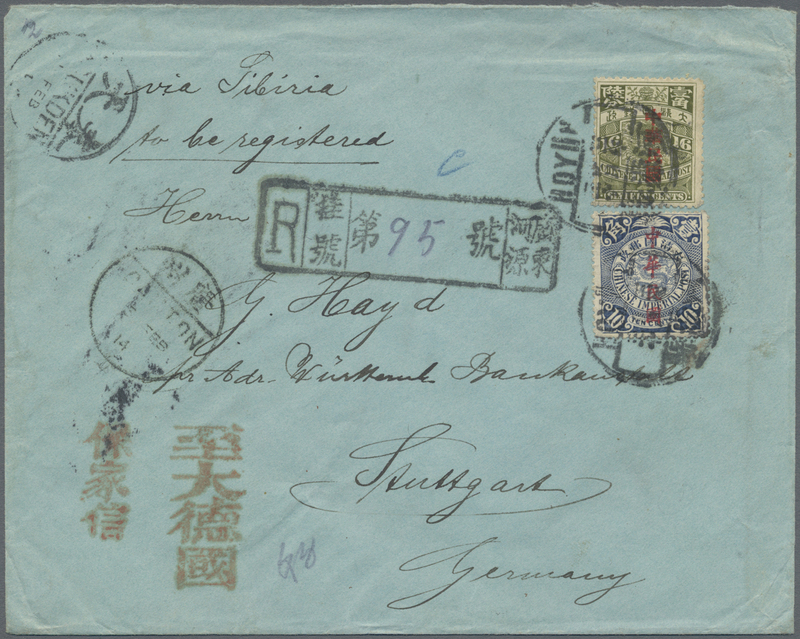 5962 gestempelt (marked) Brief (cover) 4er (Block) 94/106-ex 1912, Statistical Office overprint, cpl. 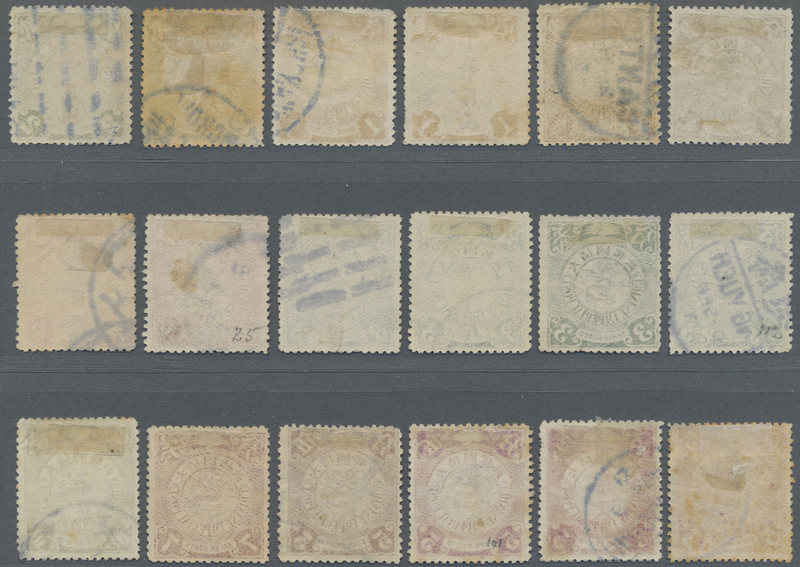 used set 1/2 C.-$5 mounted on page inc. extras: 1/2 C. block-4, 1 C. with additional small black ovpt. 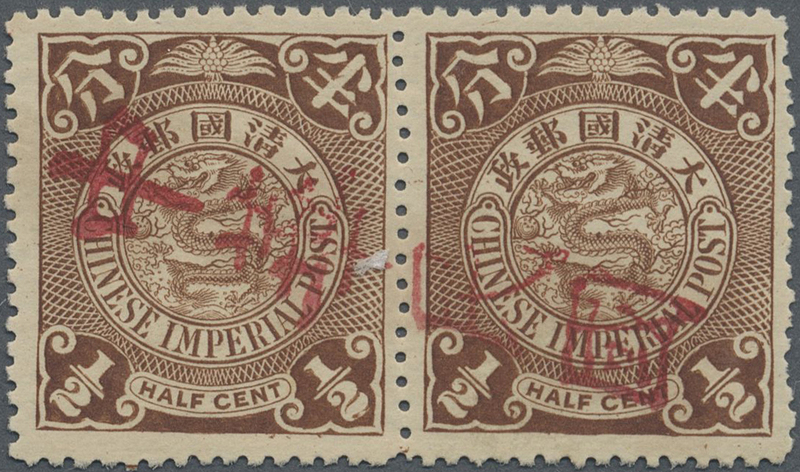 "China Republic" used Harbin 1914, 5 C. interpanneau pair. 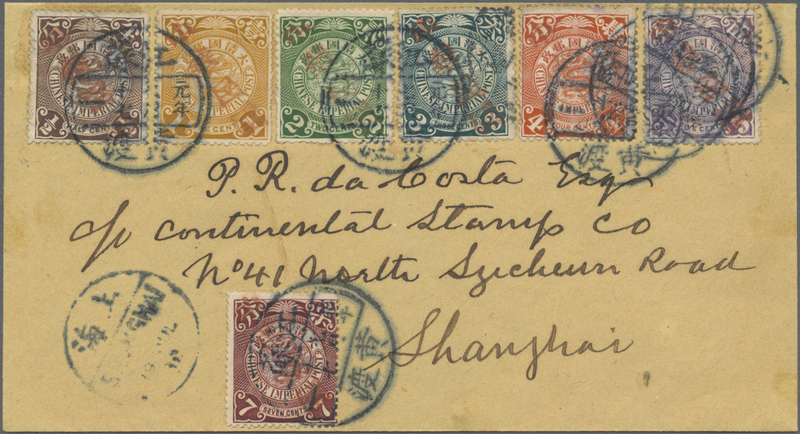 Also 2 C. green tied boxed bilingual "FANTGZE" to 1913 red-band cover to Tsingtau, addressed from the left by a foreigner (Michel cat. 550.- +). 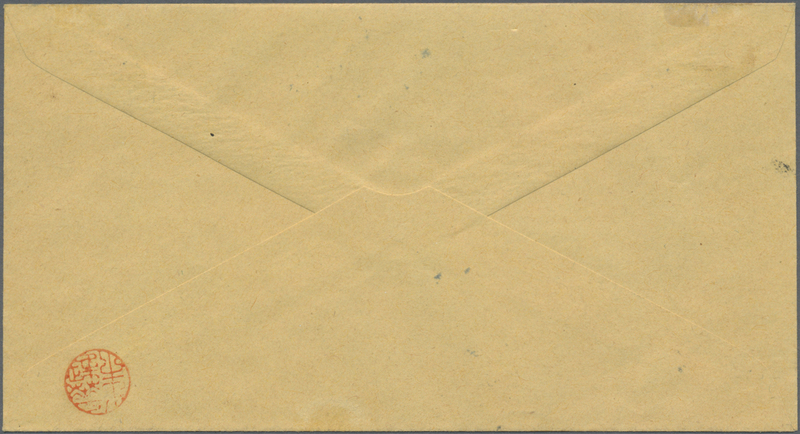 5963 ungebraucht (hinged) * ungebraucht ohne Gummi (unused without gum) (*) 95 1912, Statistical Office overprint, 1 C., a bottom selvadge copy, grossly misplaced overprint(s) unused partial gum, an eyecatcher. 5965 ungebraucht (hinged) * gestempelt (marked) 95/97K 1912, Commercial Press ovpt, ovpt. 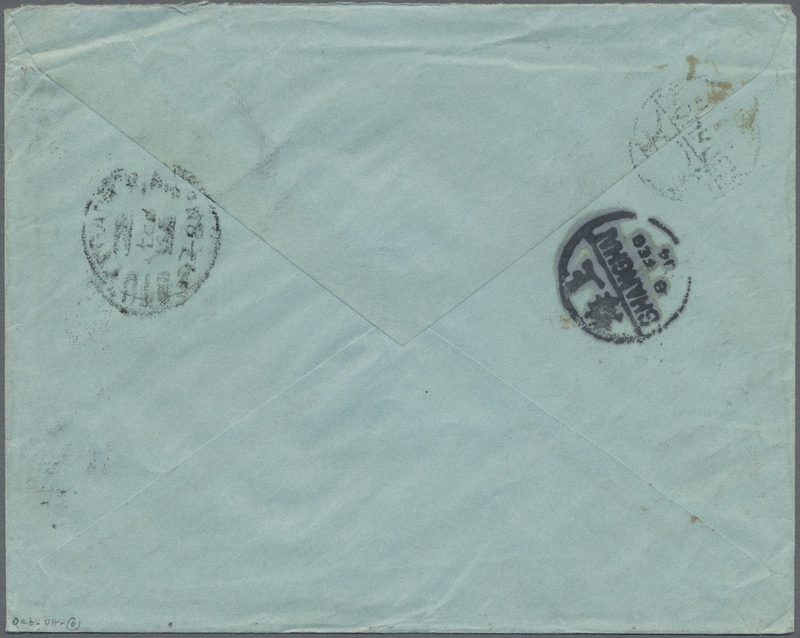 inverted: 1 C. unused mounted mint resp. 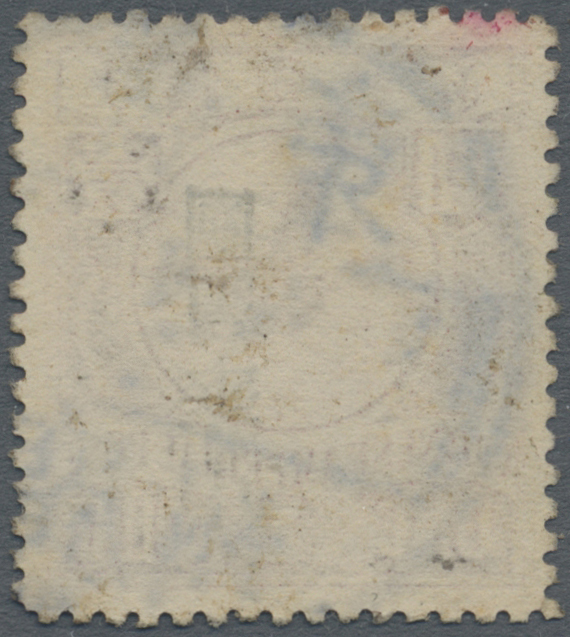 3 C. used (Chan 153d, 155d). Also a 2 C.ovpt. 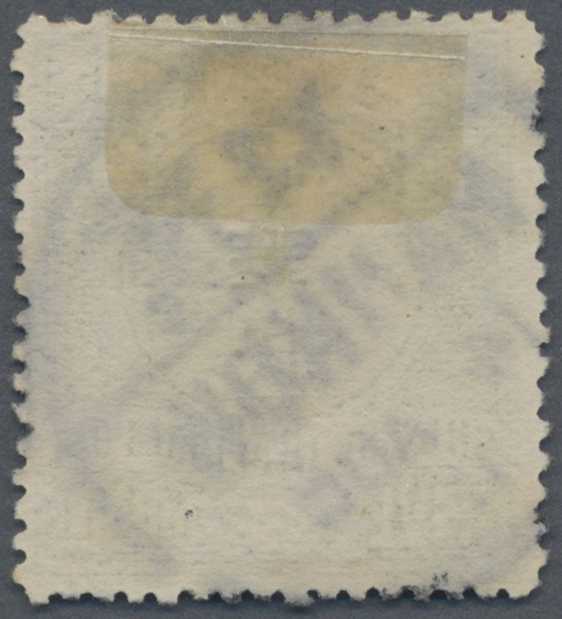 inverted, used, not listed by Chan, therefore offered "as is", reference only. 5967 ungebraucht (hinged) * 106 1912, commercial press ovpt. 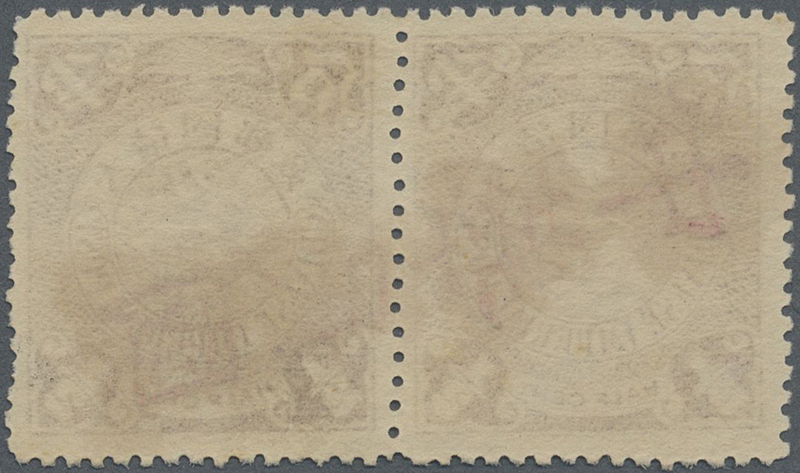 on $1, unused mounted mint first mount LH (Michel cat. 330.-). 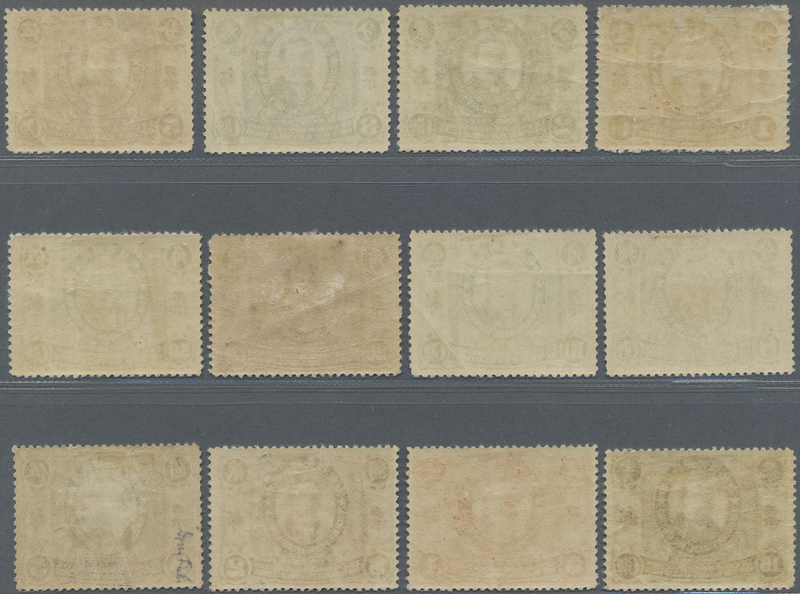 5971 ungebraucht (hinged) * 109/123-ex 1912, Waterlow surcharge, set 1/2 C.-$5 complete, the 7 C. a top left corner margin copy and 3, 4, 5 and 10 C. with extra copy (shades) and a 1 C. right-margin block-6, unused mounted mint (first mount LH for 20 C. to $5, one 10 C. small thin (Michel cat. ca. 2470.-). 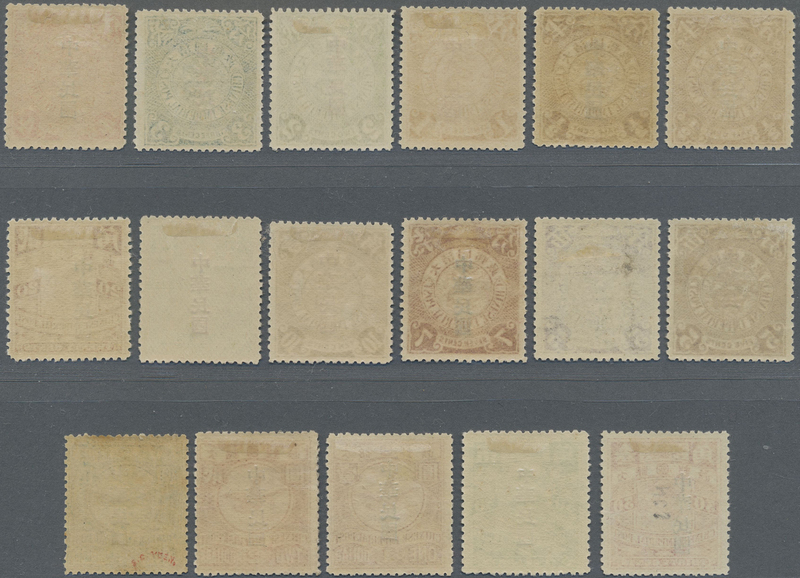 5972 gestempelt (marked) 109/123-ex 1912, Waterlow surcharge, set 1/2 C.-$5 complete, used, 1/2 C.-5 C. and 10 C. with extra copies (shades), used (Michel cat. ca. 930.-). 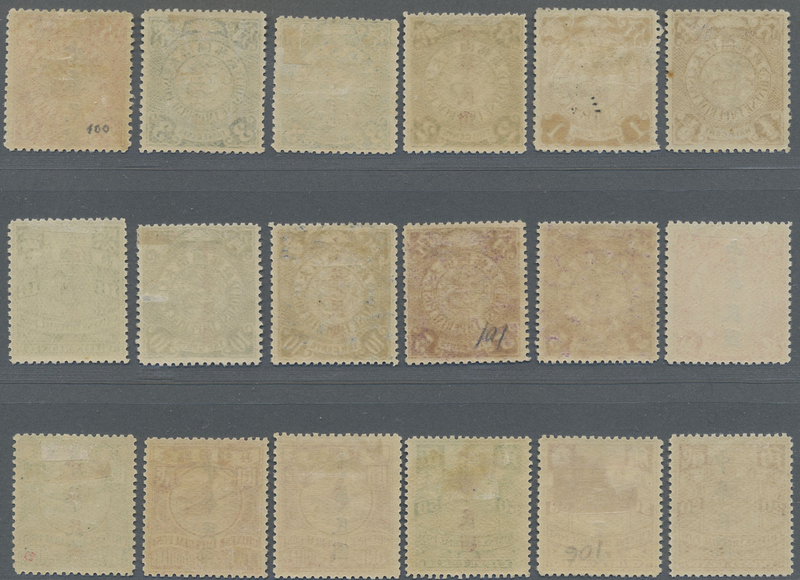 5974 ungebraucht (hinged) * 124/135 1912, 1st anniversary Dr. Sun set 1 C.-$5 cpl., unused mounted mint, several w. slight gum creases (Michel cat. 2100.-). 5976 schön (beautifully)postfrisch (never hinged) **ErsttagsblätterAnsichtskarte (Picture postcard) 124/135 1912, 1st anniversary Dr. Sun set 1 C.-$5 (ex 5 C., 15 C.) ovpt. "SPECIMEN", no gum, rare. 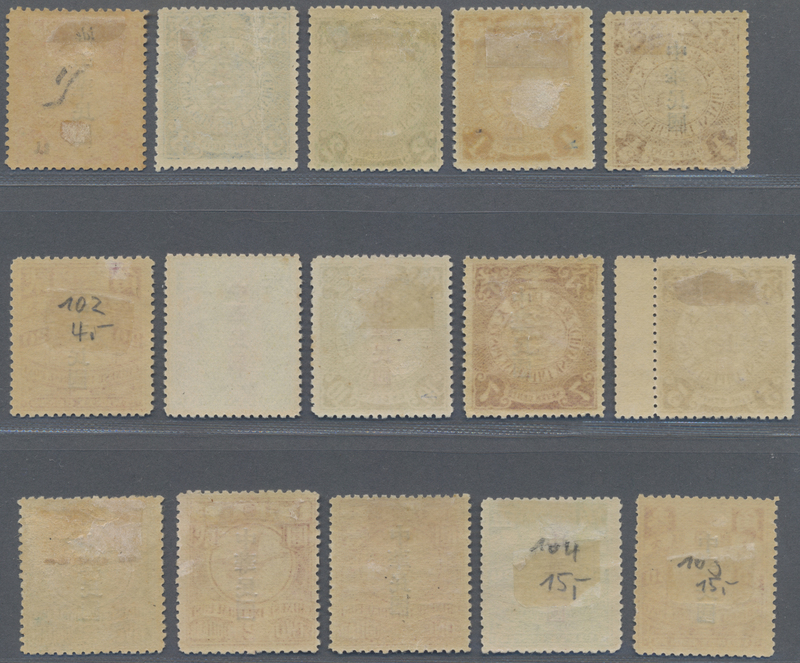 5979 gestempelt (marked) 124/135 1912, 1st anniversary Dr. Sun set 1 C.-$5 cpl., clean used (Michel cat. 750.-).